On the weekend of 17th and 18th May, an outstanding weekend was had. 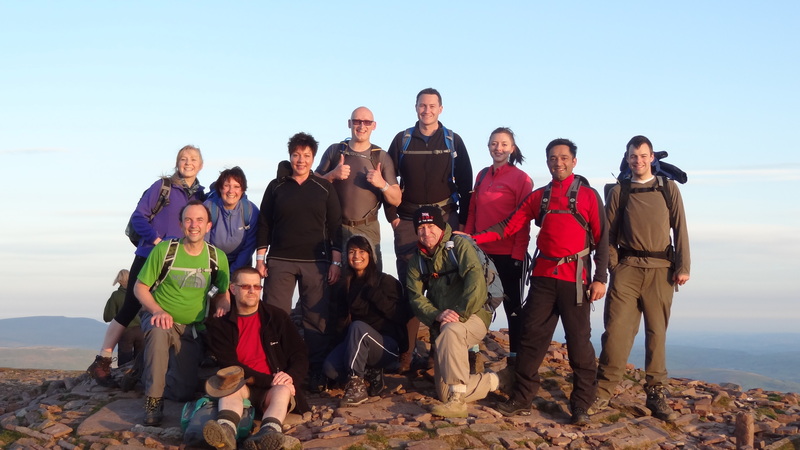 Accompanied by 11 work colleagues, a trip to do the “Welsh Three Peaks” was undertaken, and a massive success all round it was too. The Welsh Three Peaks are Pen Y Fan, Cadair Idris, and Snowdon. 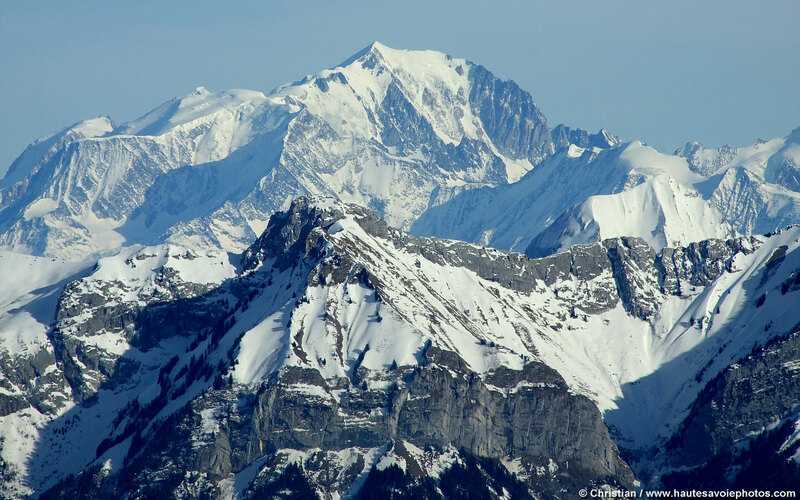 The name is due to the fact that they are the highest peaks in South Wales, Mid Wales, and North Wales respectively, at 2,907ft, 2,930ft and 3,560 ft respectively. 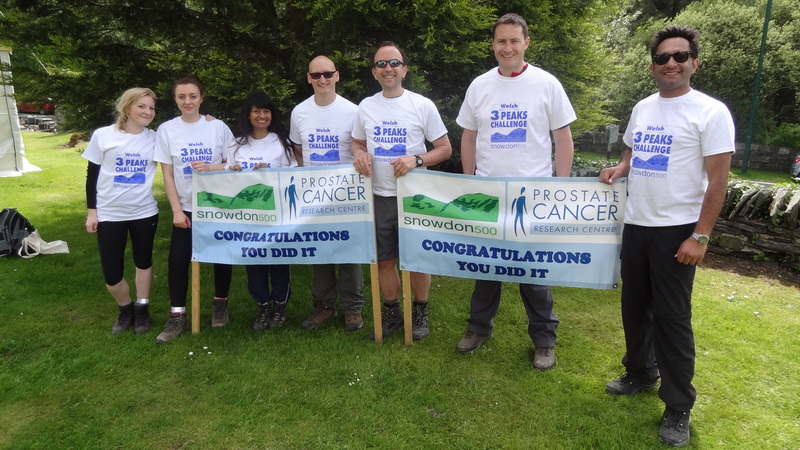 It was part of event know as the Snowdon 500 Welsh Three Peaks Challenge, and was a charity event in aid of Prostate Cancer. 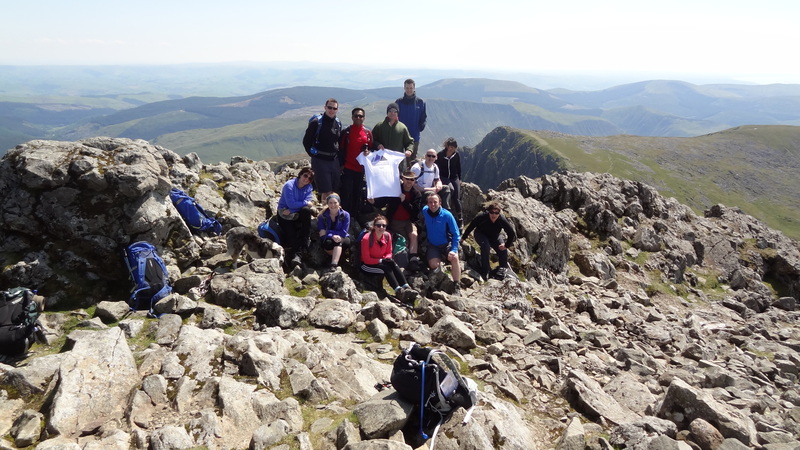 About 650 people took part, 150 on the whole three peaks, and 500 for just Snowdon on the Sunday. Leaving work at around 3pm on the Friday afternoon, we hired a minibus for our adventures, and arrived in South Wales that evening at around 7pm. It was to be a very long weekend, and with the assembly point for Pen Y Fan being 4.30am on the Saturday, we left our hotel in Merthyr Tydfil at 4am, having had not enough sleep from the previous night (despite a remarkably sensible amount of alcohol being consumed), but everyone made it just fine. So from left to right we have: (back row) Lyndsay, Carmen, Liz, Simon, Eifion, Sophie, Kuldeep and James, and (front row) yours truly, Neil, Khilna and Mark. 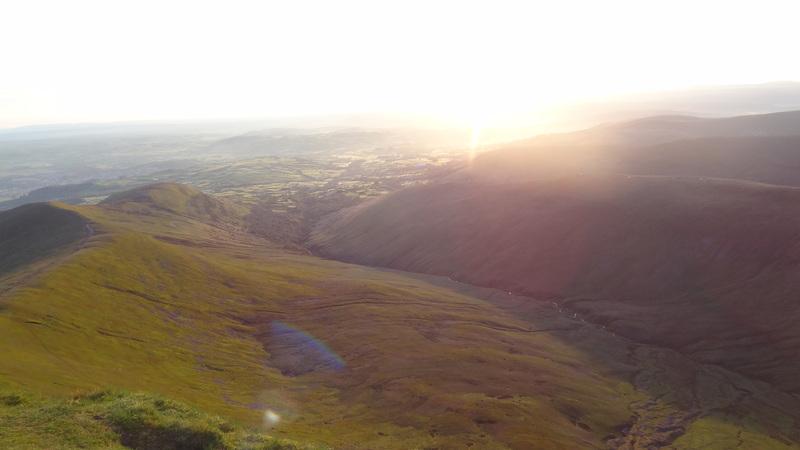 Looking down from the summit of Pen Y Fan just after sunrise – I’ll never make a photographer will I? There are not many more beautiful things on this planet than seeing the sun rise from the top of a mountain, no matter which mountain. It makes the effort of getting there in the first place so worthwhile, and blessed with weather like we had, I counted myself very lucky to be there. 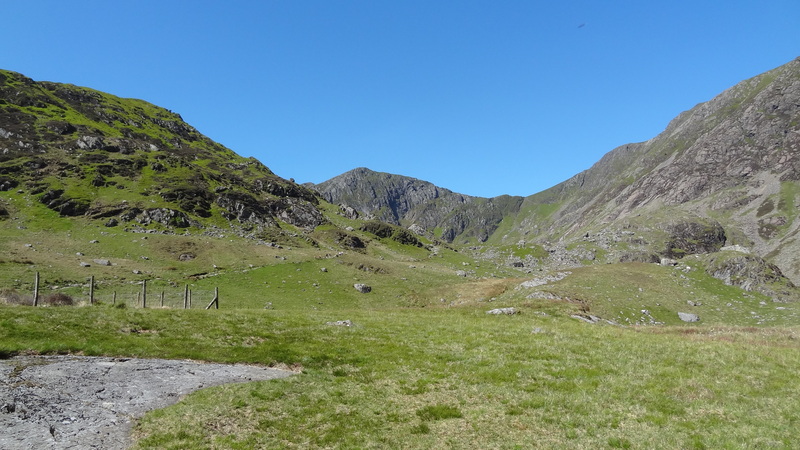 With everyone back down and in the minibus by about 7am, we began the 2 and half hour journey up through Wales towards Cadair Idris, at the southern end of Snowdonia, and near the west coastline of Wales. Despite a lack of sleep, and no sausage sandwiches (a promised “burger van” never materialised), we had a good journey up and arrived just before 10am. 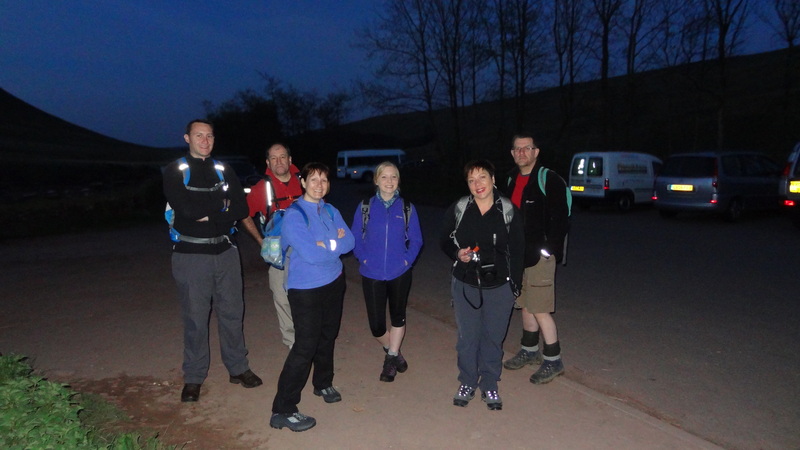 We took the “Minffordd Path” horseshoe route, the first time I had done this, and great route it is too. 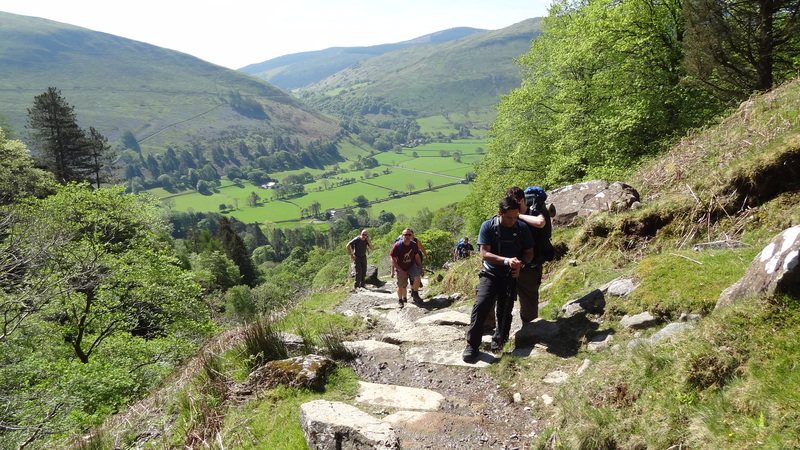 It is a ridge walk in the main, at about 7 or 8 miles, and tough going in places too, especially as hot as it was. 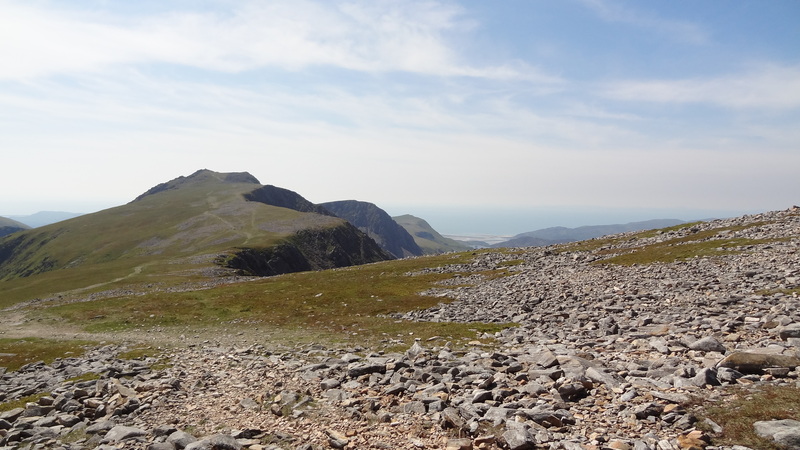 And the summit eventually comes into view….just look at that sky – this is Wales! 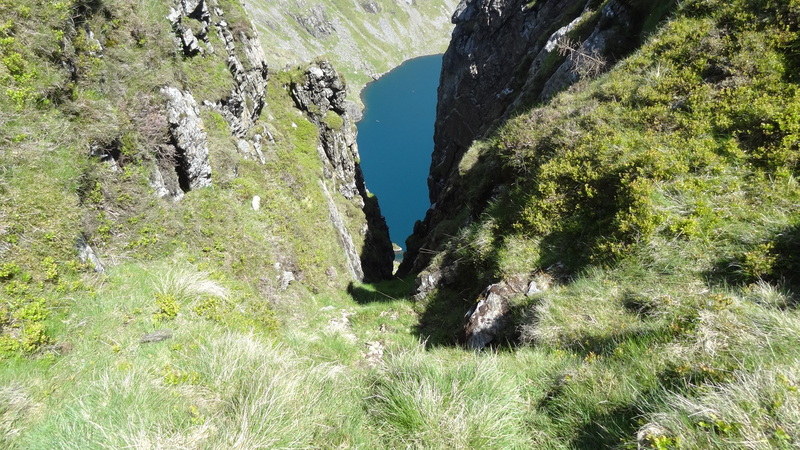 …with some precipitous drops down from the ridge to the lake far below. 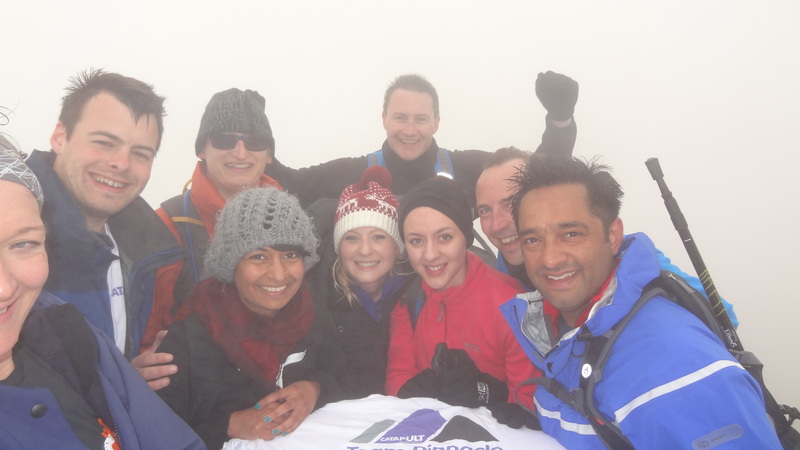 Everyone made the summit at around 1.30pm or so, despite some false dawns (from me!) about how far, and around which corner, the summit actually was, and we earned a well deserved break for lunch. 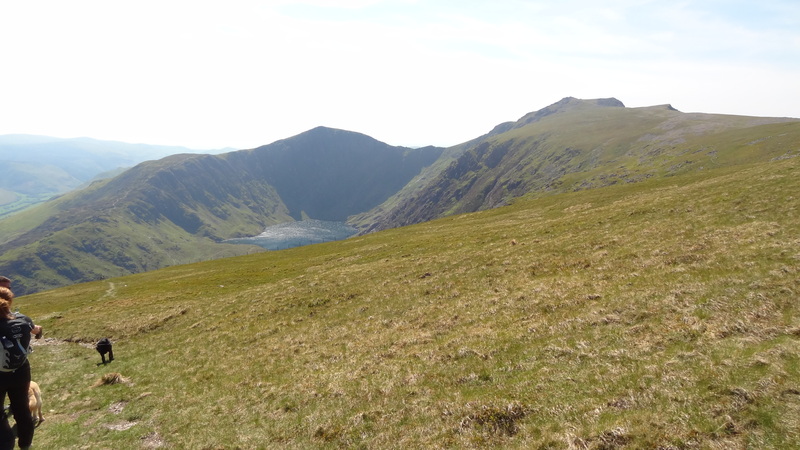 At the summit of Cadair Idris, and a great spot it was too. Walking down from the summit, three of us (Neil, James and I) took a separate path to the summit of a subsidiary peak, Mynydd Moel, at 2,831 feet (well it would have been rude not to, as it was there in front of us), which was an easy walk, but afforded great views back to the summit of Cadair Idirs and the Barmouth Coast and the Irish Sea beyond. Looking up to Cadair Idris from Mynydd Moel, the Irish Sea in the distance. 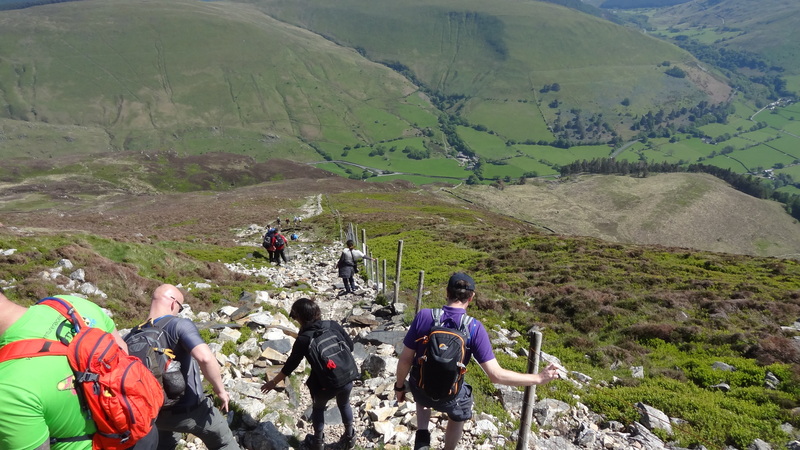 Taken from just below the summit of Mynydd Moel, the horseshoe walk that we have just undertaken comes into view. The steep path down to join the earlier path we came up on – hard going on the knees! 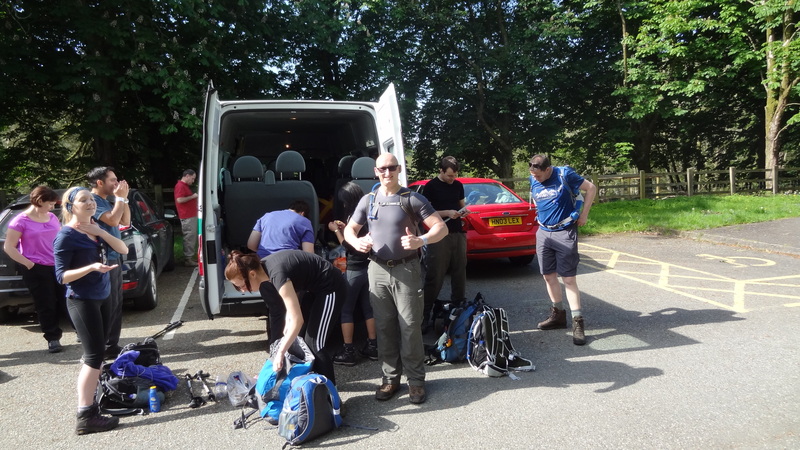 Having assembled all together again at about 5pm, we set out off up to our resting point for the evening in Caernafon, a further hour and a half drive, and about a 15 minute drive from Llanberis, from where we would start our ascent of Snowdon the next morning. After being well fed (for a Premier Inn anyway!) and after a couple of well deserved drinks, everyone hit the hay for a lie in until about 5.45am for the final leg of our journey. Leaving Caernafon shortly before 7am in the end, we parked up in Llanberis for a bus to take us along with a number of other walkers on the Snowdon 500 to Pen Y Pass for our ascent of Snowdon, Wales’ highest mountain at 3,560 feet. 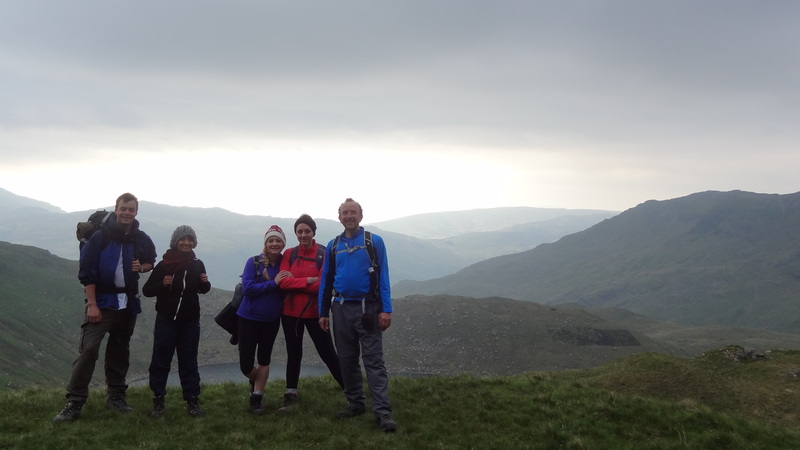 After some facing around for registration and the like, and a briefing on the bus, a somewhat colder and cloudier start to the day saw us start up the Pyg track at close to 8am. 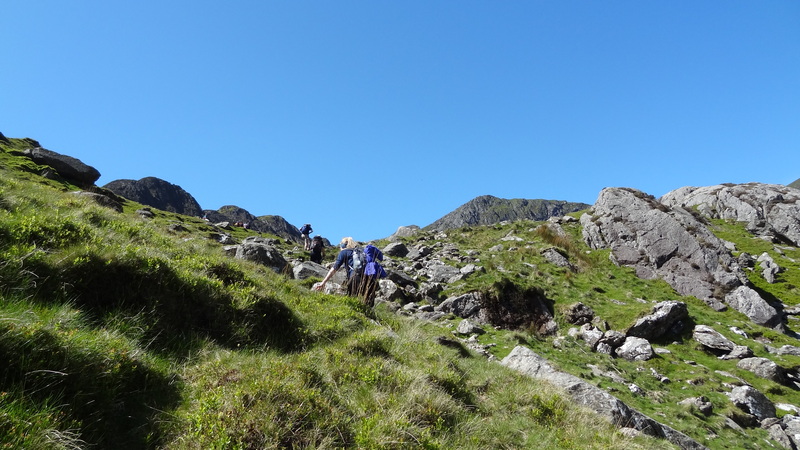 Setting off up the Pyg Track, Crib Goch in the background. Looking south over the Snowdonia National Park. 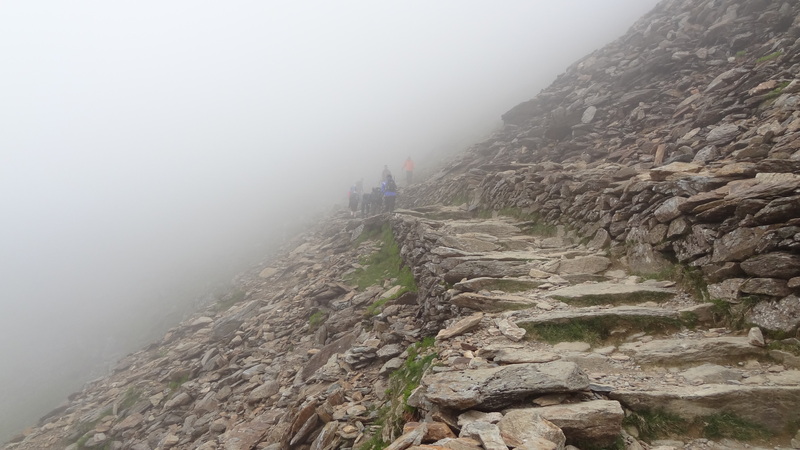 As we got higher up the walk, the summit was unfortunately never to be seen, being shrouded in cloud the whole time. 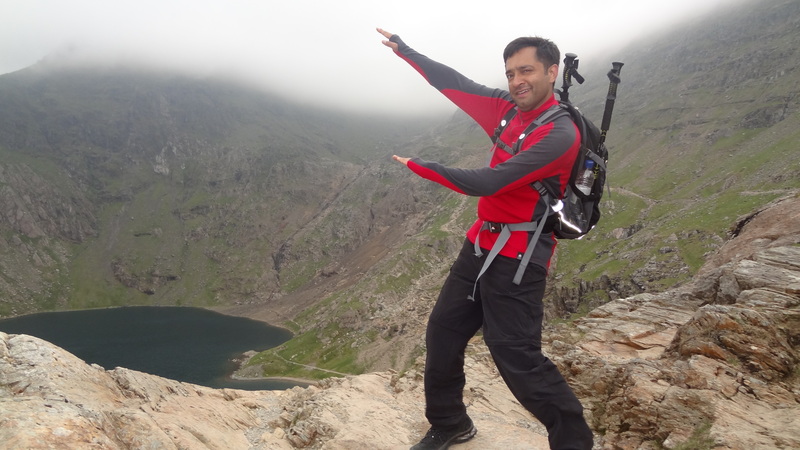 Kuldeep tries to imagine how big or how far the summit is away…. But the cloud just kept coming in…. 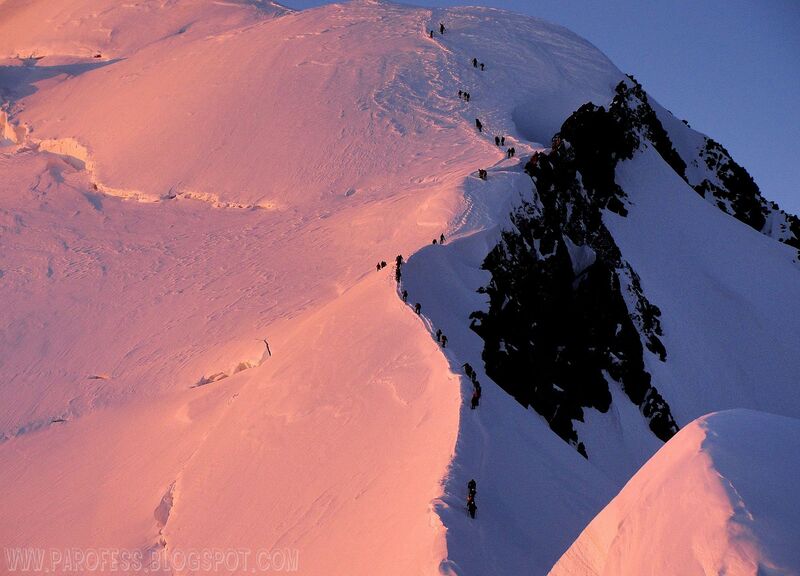 …until finally we made it to the top! By the time we reached the top, the cloud was thick, and it was windy and cold. In fact for those of you who have stood on top of Snowdon before, the cloud was so dense that you couldn’t even see the cafe (a good thing, I hear most of you say :)). 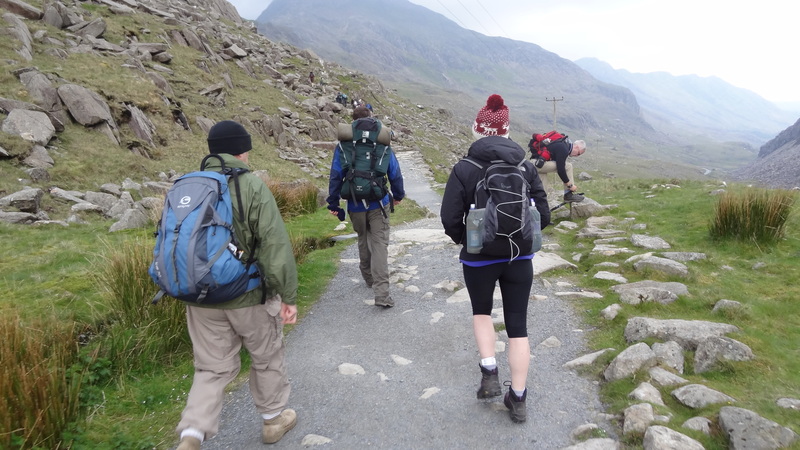 After a refreshing cup of tea (well the cafe is there, so we might as well use it) and a regrouping, we set off back down the Llanberis path this time towards out minibus and the end of the journey. 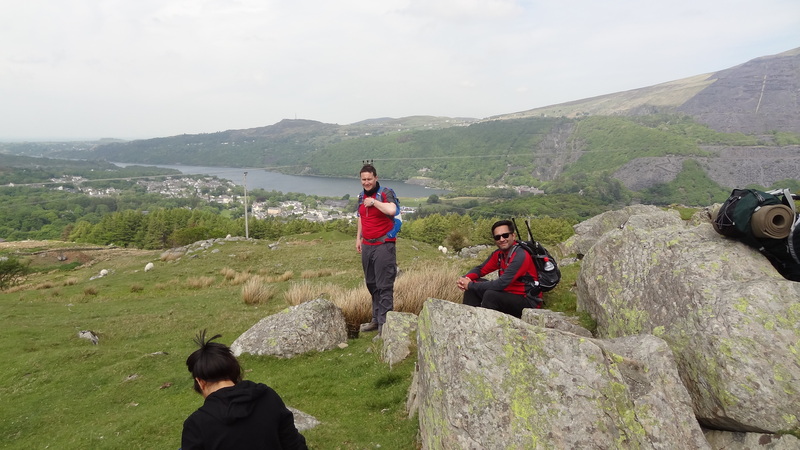 The Llanberis path is a 4 mile windy path that follows the train (yes, really) line, and so is neither steep or very spectacular. The Lake at Llanberis, and our finishing point, come finally into view. Upon reaching our final destination, the Royal Victoria Hotel, we were presented with a certificate and managed a very refreshing drink before boarding the minibus for the five or so hour drive back to Milton Keynes. At the finishing point, with our finishers T shirts. All in all it was a fabulous weekend. I did manage to mar mine very slightly by walking into a sign in the car park shortly before we left, and cutting my head, but I have always been a bit of a klutz! 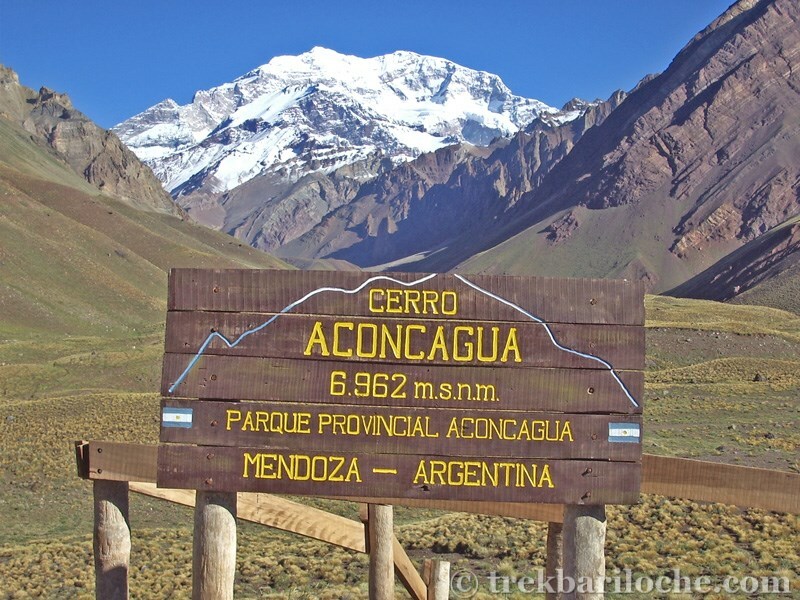 Altogether we climbed around 7,500 feet, and walked around 21 miles or so – the details are attached below from my Garmin.